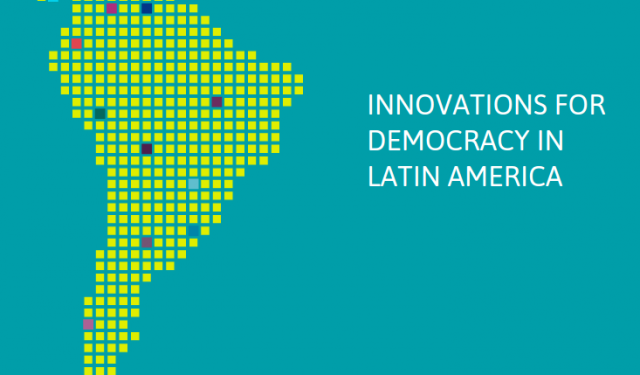 This week the LATINNO project has published its comprehensive database on democratic innovations in South and Latin America on its official website. 2,400 cases of these innovations have been collected, coded and reviewed and are now publicly available. They can be browsed with the online search tool. Several interactive visualizations have been created to sum up the data. As reported before, this project on which I have also been working on in the last months was created with the Django framework using the hvad extension for multilingual support. The visualizations were implemented with d3.js. LATINNO is an ongoing project and more cases of innovations are expected to be added to the database in the next months. The Django web framework is well suited for creating medium sized research databases. It allows rapid development of a convenient data administration backend (using the Django Admin Site) as well as appealing frontends for published data (as done in the LATINNO project at the WZB). This works well when you build a database from ground up by defining model classes at first and then let Django generate the database schema itself (Django models → Database schema). Often enough however, it is necessary to revise an existing database or at least the data administration interface. In this scenario, the database schema is already defined and hence it is necessary to create Django models from the schema (Database schema → Django models). Django can handle this situation pretty well but some advises have to be followed which I’ll explain here. In this post I will explain how to do that using the example of an interactive map for the LATINNO project. For multilingual websites built with Django the extension django-hvad is a must, since it allows to specify, edit and fetch multilingual (i.e. translatable) objects very easily and is generally well integrated into the Django framework. However, some caveats for using django-hvad’s TranslatableModel in the Django model admin backend system exist, especially when dealing with relations to TranslatableModel objects. I want to address three specific problems in this post: First, it’s not possible to display a translatable field directly in a model admin list display. Secondly, related (and also translated) ForeignKey objects are only displayed by their primary key ID in such a list display. And lastly, a similar problem exists for the list display filter and drop-down selection boxes in the edit form. I’m happy to announce that the website for the LATINNO project was launched this week. The WZB project LATINNO, lead by Thamy Pogrebinschi, collects and analyses data on democratic innovations of Latin America since the 1990. Currently the website informs about the project, the research design and publications as well as news related to the project. In the near future, a database of coded cases of innovations will be published for open access. The website was designed by Caroline della Croce and the frontend was implemented by Benedikt Hebeisen, while the backend and database is implemented by me. This multilingual website is developed in Python with the Django framework. We chose Django because it allows rapid website development, has a clear and well documented programming model and features an easy to use administration backend. We additionally used Django hvad to enable multilingual database content.